There are debates that are never easy to put to bed. One of them is the one concerning a boning and fillet knives. It is not uncommon to find individuals debating on their preferences between the two knives. One thing for certain is that you will find this argument to be quite complicated than it may seem to the ordinary eye. For one, these two types of knives bear a very close resemblance. They both appear to be small, sharp and thin. Another confusing aspect is the use of the knives. One similar task that these knives share is their use in removing bones from meat. We understand this confusion and that is why we have put together this piece to help you understand the differences between these two knives. 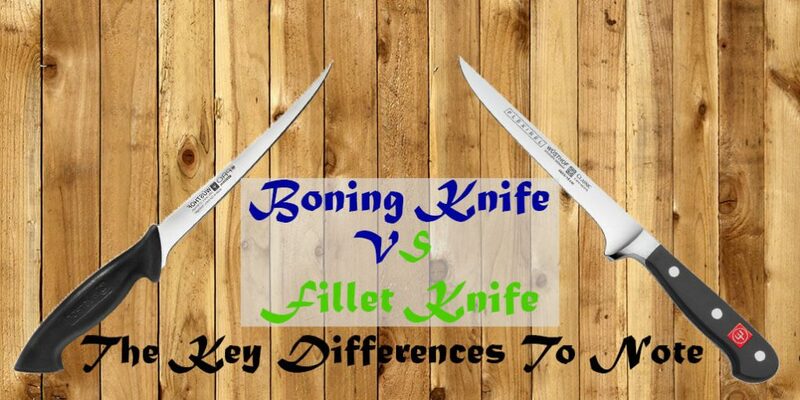 What is the difference between a boning knife and a fillet knife? The filleting knife is meant to work on softer meat such as chicken and tuna fish. You will therefore find the blade to be thinner and quite flexible. On the other hand, the boning knife is meant to deal with the tougher meat and bones. This means that if you have pork or beef, then this is the best bet for you. The tough ‘environment’ means that the blade will be quite strong. For the sake of maximum effectiveness, they are also very sharp. Since the boning knives operate on tougher meat and bones, they are quite thick and much stiffer than the fillet knife. This thickness means that you can exert as much force as you may be required to. For the fillet knife, it is meant for soft and tender meat and bones. They are therefore really sharp to compensate for the fact that you will not be using much force on it as it may easily snap. The fillet knives are thin and curved in nature, meaning that they can easily maneuverable. The boning knives are thicker and tougher, so they are also maneuverable though they are less favorable than fillet knives. The filleting blades range from 4 inches to 9 inches in length, though the most common length you will find is the 7.5 inch length. Why? Because this is a medium length, and can easily deal with the medium sized fish, which are also quite common among consumers. The longer blades favor bigger fish and vice versa. For the boning blades, the lengths range from 5 to 6 inches, although you will find the exceptional types which are beyond 9 inches. There is nothing much to write about when it comes to variation in flexibility between the different lengths. The boning knives tend to resemble the normal kitchen knives; Just straight and no deviations whatsoever in its structure. They are designed to be much longer and thinner than usual since they have to cut through tough bones and meat. Additionally, the boning knife has a straight sharp tip meaning that you would have an easier time piercing the flesh. When it comes to the manual or electrical fillet knife, the first thing that you will notice is that it is curved upwards. The tip too is curved and this makes your best bet whenever you want to make long cuts. You will however be limited as to the number of situations in which you can use such a knife. The filleting knives are mainly used in separating meat from skin. For this reason, they are quite thin since they are mainly used in making extremely precise cuts. Boning knives on the other hand are used in separating meat from bones. You get the name now, right? Just like filleting knives, they are also quite thin, but they are much thinner since they have to go through several layers of meat. They can also be used like filleting knives in making precise cuts, although you might not be too pleased with the result. You may also use the filleting knives in separating meat from small bones. This is the second function that can be done by both knives. You can interchange these knives for such purposes, although you are advised to go for the multi-purpose knives available in plenty out there. Both knives are made of high-carbon steel. This material is advantageous as compared to the traditional stainless steel since it can stay for longer periods without being cleaned, yet the stain would still come off. However, it is more prone to rust, hence it will require more attention as compared to stainless steel material, which is a combination of chromium and steel to make the metal rust resistant. This chromium however would give your knife a dull appearance and here lies its disadvantage. Aside from the differences, let us also mention the type of handles that these knives can have so that you can use them without hurting yourself. They can be made from hardwoods such as Rosewood to ensure durability. They give your knife a natural texture to maximize the level of comfort while using them. However, they tend to crack if you immerse them in water. Such handles are mainly found in the knives which you will use for lighter tasks. They provide flexibility in that you can use them outside of the kitchen. They ensure that you will have the strongest of grips during your usage of the knife. This material is extremely hard and this makes it to be impervious to water. This impermeability also increases its durability. Now that you have read about the differences between the two knives, you must have understood their preferred areas of operation or their users. The filleting knife being suited for soft and tender meat is more likely to suit fishermen when cutting open their fish. The boning knife on the other hand is likely to be in the hands of butchers as they separate the meat from the bones. Even better, you can have them both since you have seen that they are interchangeable as well. Just go for the one that suits your style, won’t you?